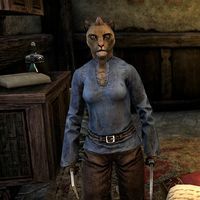 Durrali is a Baandari Khajiit innkeeper running the Silver Moons Inn, the inn located at the Baandari Trading Post. She's behind her counter directly across from the entrance keeping her cleaver sharp. "I do not want more trouble. It's bad for business. And business is often trouble enough, yes?" This page was last modified on 27 August 2018, at 00:45.